No. 850, West Hollywood’s newest hotel in one of its older buildings, is scheduled to open on Oct 1. No. 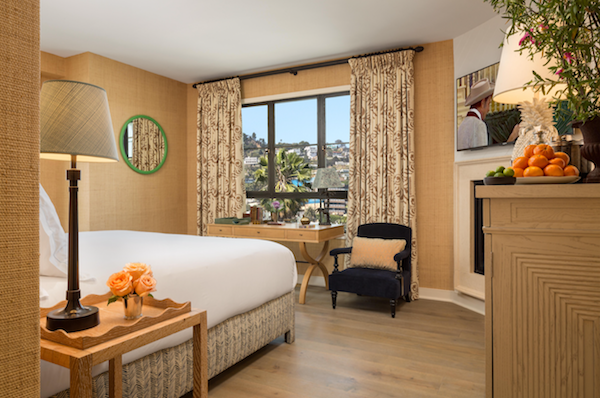 850 is a dramatically redesigned and reimagined portion of the old San Vicente Inn that takes its name from its address on the east side of San Vicente Boulevard, north of Santa Monica. The 23-room hotel will include the historically designated building facing San Vicente that is part of the Old Sherman Thematic Grouping and a new four-story building behind it. 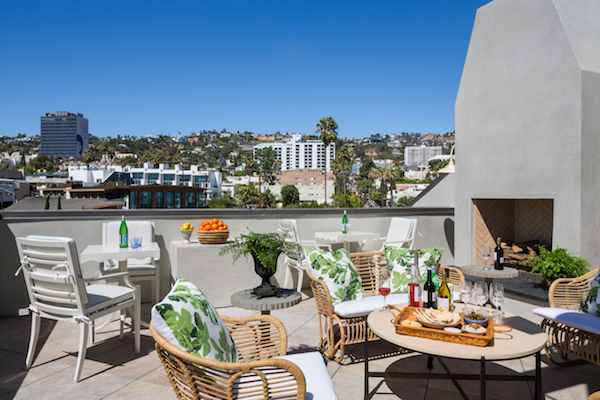 The Sherman Thematic Grouping contains some of the original residences of West Hollywood, then known as Sherman. Those homes were built between 1899 and 1907 and housed workers of the Pacific Electric Railway. No. 850’s lobby lounge also serves as a bar, with a large menu of premium wines. An intimate living area, situated on a floor above the lobby lounge, gives guests a space to relax, socialize or conduct meetings. It includes a large fireplace and antique leather armchairs. There is a residential-style communal kitchen that provides complimentary breakfast to guests and will be provide a rotation of prominent local chefs. The No. 850 website currently is accepting reservations from Oct. 1 onward, with single-occupancy rooms going for $227.50 a night. A deluxe king with a view goes for $390 a night, and a two-person suite with special perks is $705 a night. Klein purchased the 850 building in 2013 as part of a grouping of buildings on the east and west sides of San Vicente Boulevard that were known as the San Vicente Inn. At the time he purchased those buildings, they had fallen into physical and reputational disrepair. The San Vicente Inn had become a “clothing optional” space that catered to gay men and later evolved into a place that was infamous for prostitution and the use of illegal drugs by its clientele. After acquiring the Inn, Klein quickly evicted the drug users and dealers and cleaned up the property. The three Sherman-era San Vicente Inn buildings on the west side of the boulevard also are being redeveloped, and that site will be known as the San Vicente Bungalows. The Bungalows website identifies it as a “Private Membership Club – By Invitation Only” opening this Fall. WEHOville has been unable to obtain more information about that project. A guest room at the No. 850. How on earth could this be taken as a private club? It’s no comparison to the California Club, Jonathan Club, Riveria, SoHo House, Bel-Air Bay Club, and even LACC. All these clubs are exclusive and offer what this does and much, much more. This group can call it what they want—it is a bungalow hotel. Why would one want to even join this, and knowing SoHo House, which is well-respected and international, is down the street? Another London based private club will be opening soon even! This just seems as if it’s a waste of good money and could be invested much better as a member. The room rates alone, times the number of rooms, hardly make for success. I wish them luck as they will need it. I knew it. January is coming. While we’ve always known that the property was split between the east and west side of San Vicente, we were told at the time that the guests at the 850 complex wouldn’t be running across the street because the spa/resort services on the west side were for guests staying in the bungalows and rooms on that side. This appears to be the case given the lounge and bar/food being served on the 850/east side. Guests wouldn’t need to run across the street for a bite to ear or a place to socialize. What we weren’t told, ever, was that the Bungalows would be a “private membership club, by invitation only.” This needs clarification from both Mr. Klein and the City. Does this mean that the general public, including almost all of the surrounding neighbors, aren’t welcome to drink at the bar or have lunch/dinner in the restaurant? If so, this is highly problematic and it shouldn’t be this way. I’m grateful that the drug/prostitution den that was the San Vicente Inn is gone. I’m very grateful for the major investment in and restoration of these historic Sherman-era bungalows. And while I (almost certainly) can’t afford to be a “member” of the club, nor can I afford to be a daily patron at either the bar or restaurant, I’d like to have the option of walking to the Bungalows for drinks, lunch and/or dinner with other non-member friends. I’m not interested in swimming in the pool or having à la carte spa services, just the opportunity to eat at the restaurant. 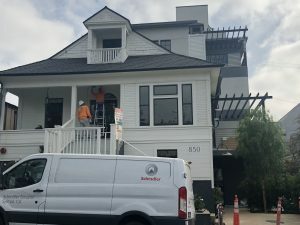 When are they going to tackle the growing homeless issue in Weho? People don’t feel safe walking the streets, especially at night. Pretty soon, you will need an exclusive invitation to buy a quart of milk in Weho. This is getting boring. Very disappointed that the San Vicente Bungalows will be a private membership club. At the time this was going for approval, the community rallied around the project in part because we were told we’d enjoy the new restaurant and bar that was going to be added. Now the community won’t be able to visit the restaurant and bar. Don’t like the fact that the developer changed this to a private club after he got the community on board with the project. Bad faith.